Who wants to become the Next celebrity stylist or make-up artist? Are you interested in pursuing a career in Cosmetology, Esthetics (Skin Care), Professional Make-Up or Nails? 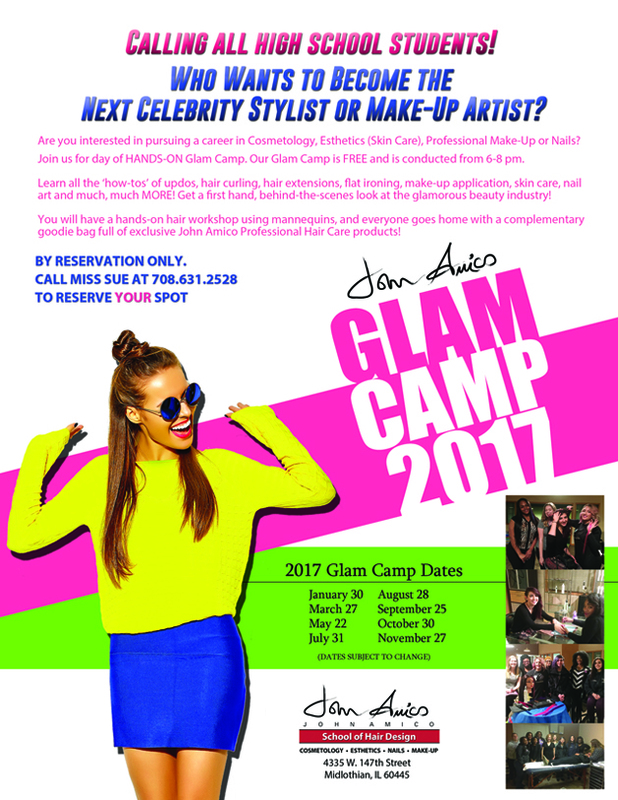 Join us for day of HANDS-ON Glam Camp, Our Glam Camp is Free and is conducted from 6-8 pm. Learn all the ‘how-tos’ of updos, hair curling, hair extensions, flat ironing, make-up application, skin care, nail art and much, much MORE! Get a first hand, behind-the scenes look at the glamorous beauty industry! You will have a hands-on hair workshop using mannequins, and everyone goes home with a complementary goodie bag full exclusive John Amico Professional Hair Care products!